*Updated to direct you to what Juli, a trusty correspondent in Umbria, dug up about Graziano Cecchini and the ball stunt: Behind the Balls. The other day Rome’s Spanish Steps were having a ball. 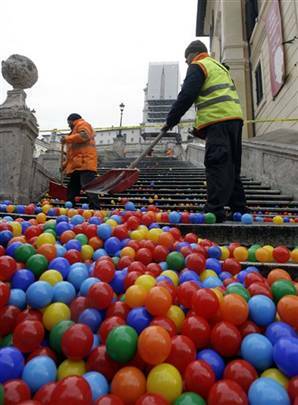 Well, actually a half million of them as red, blue, yellow, and green balls flowed down one of the Eternal City’s most famous landmarks. Cleaners were on the ball, so to speak, and got the lot of balls cleared out rather quickly, although they also had help from tourists who grabbed some of the only free souvenirs they’d find in the Bel Paese. Word has it that some balls even quickly found their way to eBay. This is the Trevi Fountain dyed red in October. Leaflets found nearby said that the red represented the red carpet of the Rome Film Festival and the water was dyed red in protest of the expenses incurred organizing the event. After the Trevi Fountain incident, Cecchini was investigated for possibly damaging historical monuments, but experts said that, thankfully, none of the red color had seeped into the 18th century fountain’s marble structure. So what do you think about such displays? Does it make you want to browse listings of Rome hotels, make a reservation, and wait for another show? And would you have, ahem, grabbed a ball–or did you? A little bit of Modern Art blending in with the Classics. I will take this over the graffiti painted on all of the old buildings and works of art that I witnessed last Summer in Italy. Agreed Gil–the graffiti can be *so* ugly! At first glance (from the photo), I thought the balls were water balloons. But after I went to the site and watched the video, I realised that they were in fact, bouncy balls. I have never been part of a public protest, so I honestly don’t know what to say. Obviously, they are doing it for a reason. Good thing none of those old people rolled down the stairs with the balls as it happened. Now THAT would have been bad! I see no harm in a peaceful protest. Hah! Yeah, I was wondering where all the balls came from too. And then where they went, actually. Some landfill somewhere just got a lot more colorful? Hmm…. well…the balls on the scala di spagna seems a bit whimsical…but the fontana di trevi dyed red? It was on the news here….and I was considering a post about it as well. They said he did it as a protest to the garbage problem in Naples (which is another story). I guess in this case, it didn’t do any harm, but I did not agree with the Trevi Fountain incident. BTW…if that Naples problem keeps up, I wonder how long before you get a whiff when the wind blows South???? My Melange’s last blog post..Happy Birthday My Melange! Also, can I say how much I love this “last post” plugin? I might not have made it to your party today otherwise! I agree with the above poster. I don’t mind the balls. I made all the news here, local and national. They quote one American tourist who said “Even when they protest, the Italians do it beautifully” or something like that. His was able to get his point across throught his art. I’m glad his dye didn’t ruin the marble at the Trevi Fountain however, and I am still confused about what his issue was with the Rome Film Festival. Yes, I think the balls were definitely a much better protest than the dye–although the fountain wasn’t actually harmed, so that too was pretty harmless. And I, too, don’t really get the thing about the Film Festival. Just because it cost so much money perhaps? I never got my hands on the leaflet text…maybe Shelley knows? I also heard about the balls on the news, but only in passing, I had no idea it was for a protest. The Trevi Garden dyed red, a bit creepy and gruesome, it really does look like a blood bath. I have never partaken in a protest, I understand why some people do protest, but I have not been moved by anything to protest. Of course, I’m not much of a news watcher, or I probably would be protesting something. I just hope that in their protesting that they do not harm the beautiful artworks, that would be a shame for them to have survived all these years to be ruined because someone was upset about something. I’m not much of a protester either Wendy; and yes, I agree–it would be a shame to have centuries-old monuments, etc., destroyed at this point. Thanks for stopping by and commenting! Yes LJ, the “blood bath” comments are hitting home with me too. I think in terms of the balls, no problem – the fountain, though, bothered me. If there had been lasting effects that would have been beyond criminal. As the daughter of an art historian, I’m fussy that way. And yes, it sure did make the news here. But when I saw the clip after Diane Sawyer reported on it, she said, “The Italians sure need to find something to do.” And I really disagreed with that because I thought this was a fairly playful way to get a point across. I’d rather it wasn’t just *his* point, though – better he’s doing this with an environmental organization or something similar. Well I certainly think you’re right to be fussy. And I think the strange thing about both of these is that it’s really been unclear as to *what* exactly is being protested–at least as reported in the news. Perhaps that’s purposeful by the Italian media, but it seems to be for the sake of art and protest as far as I can tell. Which isn’t very far, I’ll admit. I think it’s fairly harmless – and if it is not causing too much drama, it’s ok. For art, sure. For protesting? Not sure about that one. I would have LOVED to be there with the colourful balls. Reminds me of a Sony ad on tv here. alyndabear’s last blog post..Rain, Hail or Shine? Yeah, I would’ve loved to be there for that too–although like it was mentioned above, thank goodness no one was in the way of the falling balls! Personally, I don’t see the “art” in doing things like that. I guess I’m more of a traditionalist when it comes to art. Not so much a fan of modern art, myself. And that’s coming from someone who works in a design firm! 🙂 I definitely didn’t like seeing the red water in the Trevi Fountain. Something like that feels so wrong in relation to something that old. How sure was the guy that his red dye wouldn’t affect the marble or structure in any way? That was a risky little game. But I do have to admit, even though I don’t appreciate this form of “art,” I still would have snagged a ball or two as a souvenir if I’d seen that demonstration. 😉 Would make an interesting conversation piece when you get back home, just not in the same way the “artist” anticipated. So true–how could he have been *sure* that there’d be no damage with the paint or dye or whatever? Too risky! And I would’ve grabbed a ball of each color methinks. It’s a moment in history–and as you said, a great conversation piece–no matter how you slice it, right? I love art, love public art, I love to see some things we take for granted in a new way, but I do find it . . . cheap (?) to make your art on top of someone else’s art. It is not a collaboration but often it is the new artist using someone else’s creativity as a springboard for their own limited creative endeavor. They are just adding additional punctuation to someone else’s sentence. That is my two cents. 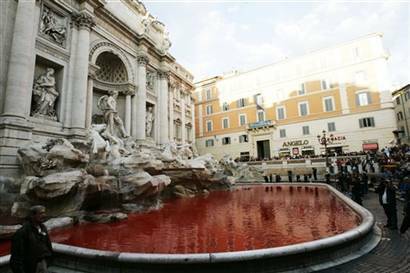 No matter the artist’s public statement, one can only think of a blood bath with the Trevi Fountain piece. I find that hard to believe he “intended” it to be viewed as something else. It is just too obvious. Excellent point David; I have mixed feelings about appropriated art myself. I tend to judge them on a piece by piece basis I suppose. And I’m certainly with you on the blood bath. Hey I was just going to write about this! But you beat me to it. I was going to entitled it “Che Palle!” Haha. I kind thought it was cool, and I wish I would have made it in time to grab a ball or two, but I was stuck somewhere. I guess people are already selling them on eBay. The first stunt, dying the Trevi, was to protest the fact that the city was using public money to pay for the film festival instead of using the tax euros to improve work contracts or finance the elderly. This protest was supposed to raise the profile of Burma and the Karen people, though people initially thought it was a advertisement for the Sony bravia tv!! Jessica, don’t let me stop you! You’re in the thick of it there! Thanks for the further info on the meanings behind the protests. The Trevi Fountain reasoning sounds great to me considering how awful some of the public services are but I had no idea about the Burma and Karen people message! I wonder where the Naples trash idea came from. People really need to be clearer about their protests, I say. Thanks again for your comment! I heard the balls were quickly put for sale on EBay for as high as 50 euro each by some clever individual. So typical, and genius I suppose. I found some listings here on Ebay.it, but the prices aren’t too obscene. I guess 😉 Thanks for commenting! Writers, artists, and musicians have often used their talent to voice protest, and the more shocking the more attention their work brings to a cause. So long as the work isn’t harmful to the people and environment, I find such passion inspiring! Diane Mandy’s last blog post..We have an offer! Thanks Diane! I just wish this guy would be clearer in what he’s protesting though because I agree–such displays *can* work for and inspire change and improvement. OK, so maybe the balls weren’t too practical (although I know, I know – it’s art! ), but the fountain water died red creeps me out. I think it resembles too much of a horror movie, but I’m sure that’s partly due to the American culture I’ve grown up with! Susan’s last blog post..Where has all the good spam gone? Okay, the ball “protest” was interesting, since no one got hurt. But taking a chance on damaging the fountain…that is so not cool. Glad it wasn’t harmed. I had to laugh on people putting the balls up on ebay though. Who would have thought? kacey’s last blog post..Are You Happy? No, REALLY Happy? Kacey, I know, right?! Where there is money to be made…. I’m still not sure how something like throwing a bunch of colored bouncy balls down the steps qualifies as “art”, but then, I’m not an artist. But really, I can see it as a protest (I guess), but not so much as art. I don’t get it. It’s closer to a performance than to any visual art, but I have to say: it annoys me. I feel like such a prig saying this, but any real artist creating an installation (guerilla or permitted) would make plans for disassembly and clean-up, instead of simply expecting other people to do it. Also, it seems like a cheap and considerably less visually interesting Christo knock-off. And it sounds as if, in the case of the Trevi fountain, that it may well have been dumb luck that it didn’t stain it (rather than careful testing of the dye before use). I understand wanting to protest Naples trash problems, but I fail to see how dumping half a million balls for someone else to clean up makes the point. That said, boyfriend clearly has a knack for showmanship. Excellent point. And actually that’s what kind of bothered me about the photos–seeing the city workers cleaning things up. As if they don’t have enough to do. Plus kind of goes against the intention behind the fountain protest if it was indeed against using city funds for the film festival. Not sure using city workers for clean-up of your protest is any better…. i’m definitely not bothered by modern art/peaceful protests. in fact i encourage them. as long as no masterpieces are destroyed along the way. looking at the pics of the Trevi Fountain pains me as it is my favorite monument of all in Rome. I’m just thankful that the fountain isn’t a light pink hue now. phew. the bouncing balls….kinda cute, as long as no older citizens fall and break a hip due to them! So true about those hips Eryn! And yes, I think we’re all grateful for the Trevi not being pink. I think that as long as these things do no damage, I have no problem with them. They are creative, and often beautiful, ways of getting a message out. With so much information out there, it is hard to call attention to any one point of view. These works grab your attention, make you look, and make you THINK. I think that is where they are good. Even if you don’t agree… even if you passionately disagree, you are forced to think about the issue and your position on it. So in the end, as long as nothing is damaged, I say YAY! I liked the Trevi protest bit, but was as trepidaceous as many here that it would leave a stain – though if Rome city water hasn’t done it after so many years, some food colouring was probably never much of a danger. I like head-scratching anything (well I don’t think I’d like lice very much), although I do go back here to what David wrote about building on another’s art to get there–which I think is often OK–or even destroying it–which I don’t think is ever OK. Those gates are cool! Hah, I remember the William Penn statue in Philly wearing an Eagles jersey every now and again…no I don’t have a problem with that either. It seems that for most of us, “damage” is the line we don’t want crossed. Wow…that looks like a blast! I think it’s art. It makes you think. It makes you smile. What more do you want? Lynn, it certainly does make one want to bounce around a bit, doesn’t it? The bouncy balls is kind of a fun idea…kind of cool actually, and really easy to clean up anyway. Doesn’t hurt anyone. But the Trevi Fountan incident does not impress me at all. That’s vandalism. Tina’s last blog post..Tina, you are a bad blogger! Seems like maybe Signor Cecchini learned something from the Trevi display? Forse. I agree with most of the others — the balls were whimsical; the fountain was closer to vandalism. I don’t see how either of these are truly a protest, though. I do think the picture posted on your blog from MSNBC is beautiful — the juxtaposition of the colorful balls against the gray concrete of the Spanish Steps is beautiful. In that way, I guess it is art, or at least, to me, aesthetically pleasing. Bella there are some more great photos here! Whatever the reasons….the message was heard!! So it worked….attention where attention was sought. Can’t judge the motives, but in this age of scepticism I can’t help but wonder. And tooooooooo conservative as well!!!! to this bright and shiny new home over here! i can hardly wait to see what you will be doing next! hope my coins were left untouched! Yes, My kids are better, thank you! Yes, I love children~ and I do want more, but it was a trying time. 🙂 Thanks for stopping by! Sarah’s last blog post..And the winner is…. Glad to hear the kiddies are feeling better Sarah! And yes, I wonder whether there were any ball fights too–would be hard to resist! Thanks for the video! I imagine it would have been *awfully* strange and surreal to suddenly have colored balls dancing around you in the middle of Rome, eh? Sort of seems like a prank from high school, not art. It should be a free country. To be honest it all seems like a publicity stunt and I have to admit it did make me chuckle when I read about it on the subway on the way to work. I think that at worst this can be passed off as public mischief, no permanent damage was done in either case – even though the red water in the fountain was a little creepy for my taste. Is it art? Hey I still remember the fuss over the meat dress at the AGO or when the National Gallery bought Barnett Newman’s Voice of Fire. Anyway, I too wondered about people falling down the steps because of the balls. Is it true they’re being sold on ebay? But truth be told, I almost wish I could have been at the bottom of the steps to watch them come tumbling down! Joanne, I agree that it would have been cool to be there at the moment the balls came a-cascading. And yes, it’s very true that they’re on Ebay–I linked to a page of auctions above (if they’re still valid, they’ll be on there). Well…..the balls are ok since they didn’t harm anything and actually looked kind of cool. But, I don’t think the red water was such a good idea….being around all that marble! Bermuda, thanks for adding your beans–I definitely agree about the red fountain. Scary stuff! I thought this was one of the coolest ways to demonstrate against the machine. Very creative.. whoever thought it up. Bella, definitely lots of points for uniqueness here, I agree! I think as long as it is temporary, anything for art. I love your blog, and hope that you are writing as much as you want to–I am! I didn’t take offense to the colored balls. Protesting something can be positive when done correctly to stand up for a passion. If it’s done safely – to harm none. I did find the red dye in the fountain offensive – that had the potential to damage a beautiful piece of art. Thanks so much for chiming in Diana! One thing’s for sure…these actions do get the media’s attention…and I believe that’s the primary goal here. These types of “protests” are much less about getting something changed, as they are about showing off one’s expression, creativity…and perhaps in the “activist’s/artist’s” mind…their “amazing” talent. I admit, that I do find this sort of stuff interesting…and when well thought out…extremely entertaining. However, in the two instances discussed here (balls & fountain)…both crossed the line and the person(s) responsible for the acts, should be held legally accountable. Thankfully, nobody was injured when those balls were gracefully “littered” on those steps…and the historic monument was not harmed by the “defacing” of the dye. But nobody, could have guaranteed that…and especially with those balls, the public’s safety was clearly compromised and at risk. By not holding someone accountable for this kind of thing, a “Go for it!” message is sent to everyone and anyone with some sort of axe to grind…idea to promote…or simply a “cool” stunt to pull. Had someone fallen on those steps and been injured or worse…Italy would now have a new public enemy #1. Upon conviction, the punishment would be set at a level to set an example…and an entirely different message would be sent. One that says, “You can’t do this kind of thing…and it won’t be tolerated!” There’s a fine line between CUTE and CRIME…and I think we see it being crossed. Thanks for your thoughts JT. I would *hope* that the organizers at least did an “all clear” kind of thing before releasing the balls, but still…I suppose there also *could have* been a stampede or something to get souvenirs. Good point, though, about sending a message–obviously Cecchini didn’t get the message that his Trevi Fountain incident wasn’t acceptable. Wonder what he’ll do next and for what purpose…. Michelle, thanks for posting about Cecchini. This was the first I’d heard of his “work” (since I don’t watch televised news and hadn’t read of it elsewhere on the internet). I don’t wish to seem overly negative, but I must say that I agree with what Meg and JT have written: Cecchini’s “art” is not particularly original or clever (by comparison with that of Christo and Jeanne-Claude–and other “conceptual” public performance/installation artists), and not only is it wasteful (all that plastic! for others to clean up!) but (as JT wrote) it’s dangerous (people might have slipped on the balls…and is that red dye non-toxic and harmless to birds, dogs, and cats who might drink from the fountain?). The definitions of art and vandalism will be debated until the end of time–and that’s a good thing! As for me, I believe that so-called vandalism can be artful (some kinds of graffiti, for example), but a great deal of what passes for “legitimate” art today is often just a waste of energy and resources–if it is neither beautiful nor thought-provoking. Pardon me for belaboring the obvious (or at least parroting what others have already written in response to your post). By the way, I’m still getting used to the color scheme of your blog redesign, but I really like the new format for comments (allowing you to post your response directly underneath someone else’s). I completely understand your view Rosetta 😉 Thanks for commenting! I agree with most of the previous posters – the balls, while a potential littering nightmare, were whimsical and dare I say cute and certainly could not have caused lasting damage, but the fountain? That was vandalism, pure and simple. I shudder to think at how easily a centuries-old masterpiece could have been irreparably damaged. I’m a bit late commenting here …….but I felt the need…. NO….to the Trevi being red……UNLESS… it gets rid of the throngs of people milling about. Ahhh…I remember being there years ago when there were just a few of us. You didn’t have to duck for fear of getting hit by all of the coins flying by……though I will still throw that stupid coin anyway. Is GC aware that the same thing he/they (not sure what CG is?) is hypocritical? They protest against the cost of the red carpet event yet how much money do the citizens of Italy “eat” for the clean-up of said pranks? I’m never against making a statement and standing up for what you truly believe in, but too often these things turn into spectacles for attention rather than helping making an actual point. This I find irritating.